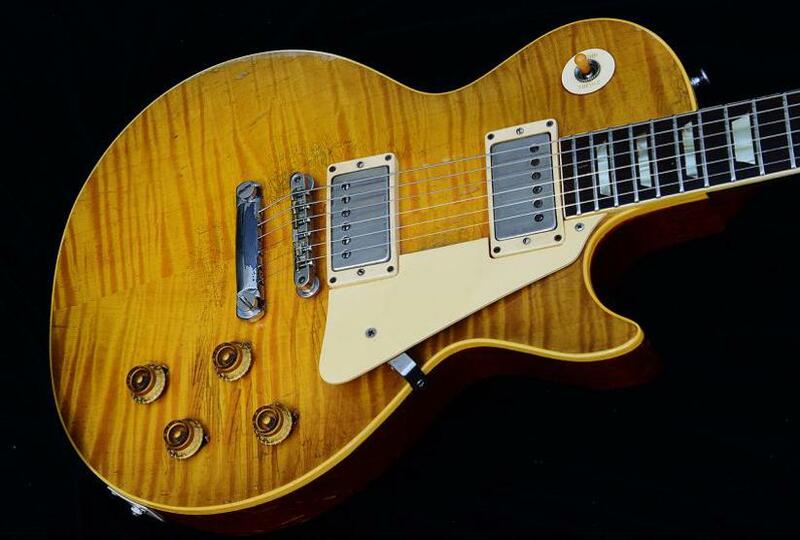 I've done my best to cobble together a 'history' of sorts, on the 1959 Les Paul guitar, serial number 9-1878, internationally known and recognized as "The Frehley Burst". The information below is readily available on The Les Paul Forum or if you simply Google ... "The Frehley Burst", you'll find this page and more ! As you might expect with a guitar that is now over 55 years old, there are many details that have been forgotten or 'adjusted', over the years. I can't and won't say that any of this is entirely irrefutable nor can I or will I say that any of it is entirely untrue. So, here it is ... The Story of The Frehley Burst. Here are some of the details on this beautiful guitar, between the years of 1959 and 1978. In 1959, a gentleman in upstate New York, I don’t know his name, bought the guitar new, from a New York dealer and intended to use it for country music. That fell through for him and he parked the guitar for ten years. A fellow named Bill bought the guitar from him in 1969, and immediately put the guitar up for sale in the local Syracuse newspapers for approximately $1,500.00. During that time a guy by the name of Gary Zamory was looking for a 1959 Les Paul after he saw Mike Bloomfield play one. So he contacted Bill in Oswego, NY after he saw the add. Gary saw Bill and haggled out a deal with him. The deal was apparently, one 1957 Fender Esquire, one 1962 Gibson ES-335, one 1956 Gibson Les Paul Special and $125.00 in cash. 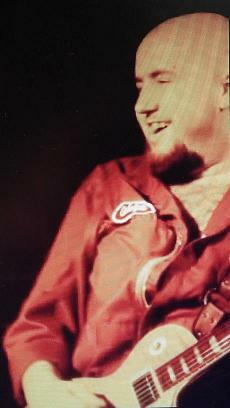 Gary was apparently a monster guitar player. He actually got a chance to go down to Georgia in the early 1970s and meet The Allman Brothers and jam with them, with the guitar. They loved the guitar and his playing. All the guitar players down in Georgia wanted to buy it from him, but he wouldn’t sell. After a time in Georgia he went back to Syracuse and played in many bands through the '70s. The writer of this account goes on ... I met Gary in November 1977 in a bar called the Poor House North where he was playing in a band called Freeze. When I walked through the door I could not believe what I was hearing, my mouth dropped as I watched this monster guitar player rip leads and blast cords with a tone I never heard before. He played through a '68, 50w Marshall and a 1x12 teal cabinet that had a D120 JBL in it. After a break, I went up and introduced myself to him and I told him I could not believe what I was hearing. He then asked me if I wanted to play his guitar. Love to !! At that point I was shaking in my boots and our relationship grew from there. It was a short time after I met Gary, that he sold the guitar. His band Freeze, broke up a month later and he was in financial debt. He got word out that he wanted to sell his guitar and a New York City store owner contacted him and met him in Buffalo where he sold it to him for $2,500.00. This transaction was done in January 1978. The guy Gary sold it to told him he would have a chance to get it back if he came up with the money. Well he did ... and the guy would not let it go. The date of January 1978, mentioned above, is potentially, a little off the mark. Ace reportedly used this guitar to record the song Rocket Ride, which appeared on Alive II. That album was released on 17Oct77, 3 months earlier. GW: "What is the best guitar you've ever owned?" 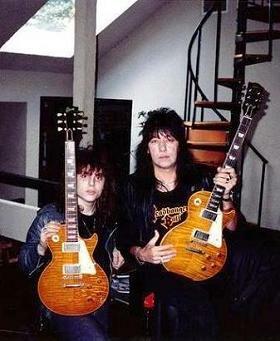 Frehley: "It was probably my '59 Flametop Standard. I bought it for $4,000, and I recorded every track on my first solo album with that guitar. Then, in 1985, I ended up hocking it for $6,000 while I was on my way to Atlantic City. I just felt lucky. I thought I was going to go down there, win a bunch of money and get the guitar out of hock. That didn't happen. I ended up losing about $20,000." "Somehow, there was a misunderstanding. I thought that I had six months to get the guitar out of hock, but the guy thought that I was selling it to him. Somebody snatched it up right away. I actually found the guy who bought it, and I had the chance to play it again. He had changed the nut from bone to metal and had done something to the frets. When I played it, it didn't feel like it used to. It didn't knock me out, so I didn't feel that bad that it wasn't mine anymore." Friedman: "Guys, don't believe anything that Ace says in that magazine. It's all garbage. Here's the real deal … Ace was going to Atlantic City, that much is true. But he sold that guitar to me and he knew he wasn't getting it back. Nothing was changed on the guitar, that was Ace's way of excusing the fact that he was stupid enough to let it go, in the first place. If Ace really had wanted to, he probably could have come up with the cash to buy it back. In those days it was a few grand. But, at that time, Ace didn't care and since it now is worth so much, he's probably mad at himself for letting it go." The picture of the receipt, below, seems to point towards an initial transaction date of October 13, 1985 (upper right-hand corner). If Ace left the guitar and a cash deposit ... I assume the cash deposit was to prevent the guitar from being sold without Ace's consent ... in October of '85 and then didn't legally sign over ownership until December of '85; then to my way of thinking, Ace's recollection of "hocking the guitar, with the intention of eventually getting it back", seems to be pretty accurate. But, as the document below clearly shows, Ace absolutely went back to "We Buy Guitars", claimed only his cash portion of the transaction and with his signature, relinquished ownership of the guitar. 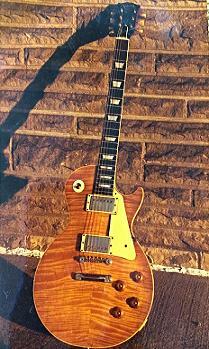 1988 is the year that the guitar's current owner, Al Romano, comes into the picture. Thankfully, after several e-mails between us and an amazingly informative phone conversation, Al filled in every blank space in the story from the time Ace relinquished it, right up to today. This is cool stuff guys ... I hope you enjoy the read !!! 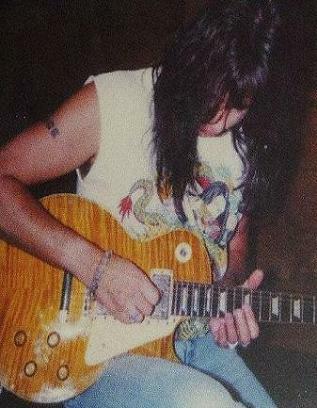 Al Romano: The 1st time I saw Ace’s guitar was in 1988. I went into "We Buy Guitars" and Richard Friedman’s Dad, Larry Friedman was behind the counter that day, when I asked to see a 1959 Les Paul. Larry pulled out the Ace guitar. When I looked at it, I couldn’t tell what was what, under the stores lighting. I thought a Sunburst was supposed to have all the color (like a Cherry Burst). 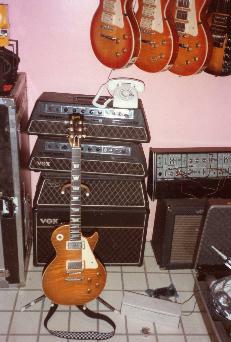 I had just looked at another 1959 Les Paul; serial number 9-1881, at Guiliano’s guitar store, which had color. 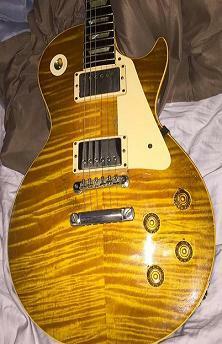 So I passed on Ace’s guitar and bought 9-1881 for $9,000 instead. 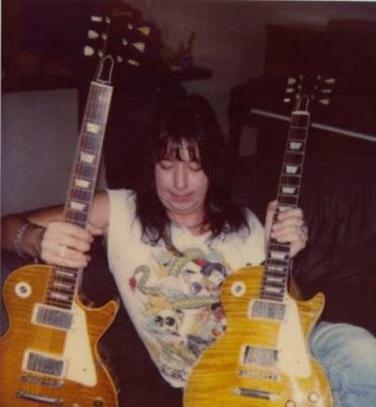 After Ace sold the guitar to "We Buy Guitars", it was put on hold, with $4,000 down, and an owed balance of $3,000, by Teddy Rondinelli (brother of former Rainbow drummer, Bobby Rondinelli). Teddy and Bobby had been jamming with the bass player from Mountain, Felix Pappalardi and my first guitar teacher had been Leslie West, also of the band Mountain. So, we were all tied together, indirectly, at that point. The Rondinelli brothers and Felix hadn't jammed for about 6 months and one night while Bobby was hanging out, at Felix's apartment, he said to Felix ... "my brother doesn't think you want to play with us anymore". Felix handed his bass to Bobby and said "give this to your brother ... this will let him know I'm coming by to play". This was Felix' main bass; a painted Gibson EB-1, known as "The Lady". Sadly, before they could play together again, Felix was killed, by his wife, on 17Apr83. I went up to see Felix’s bass and felt so sick over his death. As I opened the case, it brought tears to my eyes knowing that Felix was shot and killed by his wife. At this point I learned the story of how the Rondinelli brothers came to have Felix' bass. The bass was never actually given to Teddy to keep. After Felix was killed the Rondinelli brothers took ownership of the bass unbeknownst to Felix’s estate. I ended up trading Teddy the '59 Les Paul I had just gotten (9-1881), a '57 Black Beauty LP Custom and a re-issue Fender Strat for Felix's bass. In my heart, I just wanted Felix to be remembered; so I ended up donating the bass to the Hard Rock Cafe, along with all of Felix’s clothing and other items I had obtained. Now that Teddy had a '59 Les Paul (9-1881), he didn't want Ace's guitar, (9-1878). So, he went back to "We Buy Guitars" and got his $4,000 deposit back. Although I traded away a burst for Felix’s bass, it freed up the Frehley Burst. I didn’t plan it that way it just happened. Unfortunately, I wasn't fast enough getting to "We Buy Guitars" and Gil Southworth of "Southworth Guitars", got the Frehley Burst before I did. About a year later I was on the phone with Vic Dapra. He and Richard Friedman educated me on Bursts. I asked Vic of all the bursts you have or have owned; which one was the best sounding one ? 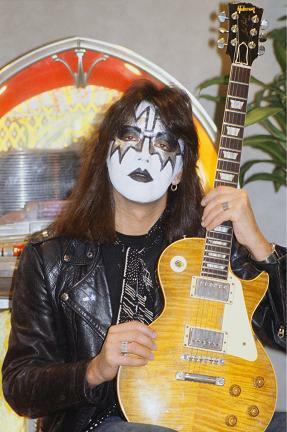 Vic replied, “The Ace Frehley burst". I boldly asked Vic to sell me the Ace guitar. He said "No ... he wasn’t selling his guitars at that time". Then about a year later, I managed to get Vic to sell me the guitar. I paid him $13,000 for it. It must have been late, in 1988 and I have had it ever since. 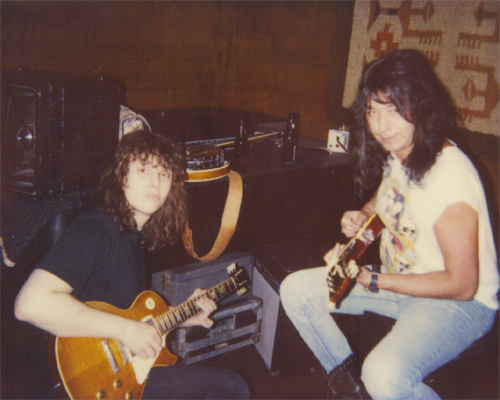 Years after I got the guitar, I met Ace and we jammed at a place called Northlake Studios. I brought his guitar (9-1878) over along with the Gruhn burst (9-0627) and we had fun playing through some old tweed, Fender Harvard amps, just like the one Ace used on his 1st solo album. 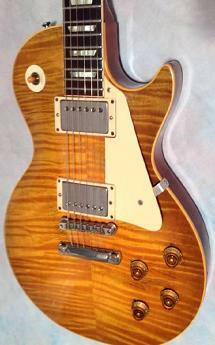 Ace told me that his 1959 burst was his favorite guitar he had ever owned. He said he had wanted to be buried with that guitar. That really made me happy that I had bought it. 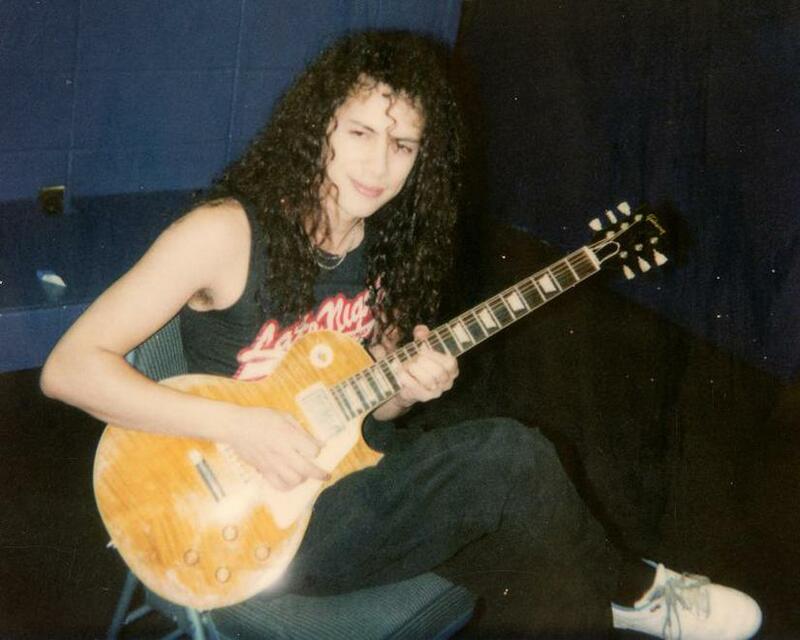 I offered to sell the guitar back to Ace for $75,000, in the mid 1990’s. Ace and his now ex-wife, Jeanette, were pretty wild, back in those days. Occasionally, they had disagreements (he chuckled). Ace told me she once threw a 1957 Strat down a flight of stairs and it didn’t break. Anyway, one night Ace and Jeanette had a disagreement over something. Ace wanted to 'cool off' and so he and his bodyguard, Tex, went out for a while. Apparently, after Ace left, she went into his studio and took his favorite guitar (his 1959 LP) out of the case and threw the guitar into the snow, out in their yard. The snow was probably about 2' deep and Jeanette stuck the body of the guitar in the snow. The guitar was standing up with 3/4s of the body covered in snow. You could still see the headstock, the neck and a bit of the body, above the snow line. A day or two after this, Ace went to play the guitar. He opens the case and the guitar is gone !! Ace and Tex search the house and find nothing. Then Ace asked his wife if she had seen it or knew where it was. She said ... "I threw it outside in the snow". Ace and Tex ran as fast as they could and saw the guitar just barely sticking up, out of the snow. They grabbed it, rushed back into the house with it and Tex disassembled the guitar to get it dried out. Fortunately, after that incident the guitar was fine with the exception of some checking on the top, from the exposure to the cold. The reality and the signifigance of The Frehley Burst is simple ... 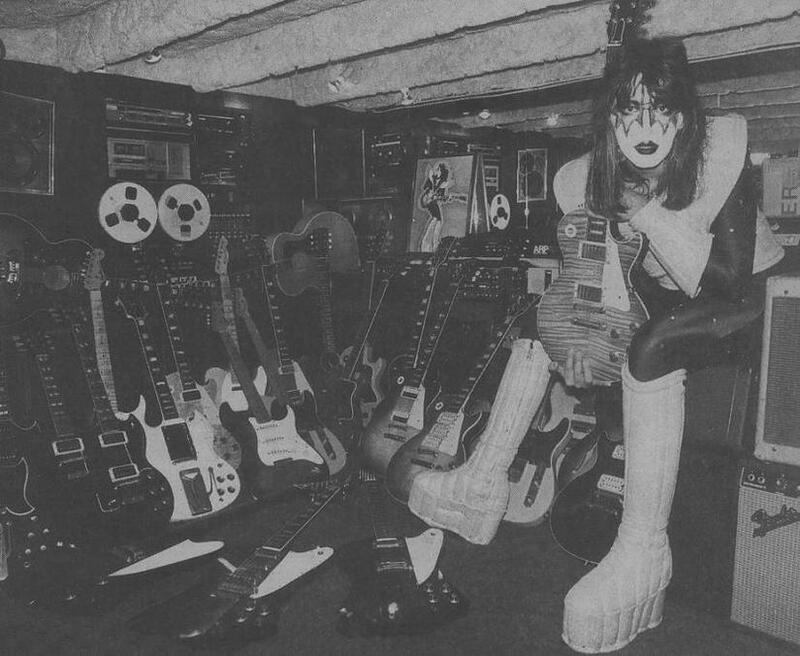 Although it wasn't a guitar that Ace was typically seen with, during Kiss' heyday and the Frehley's Comet years ... 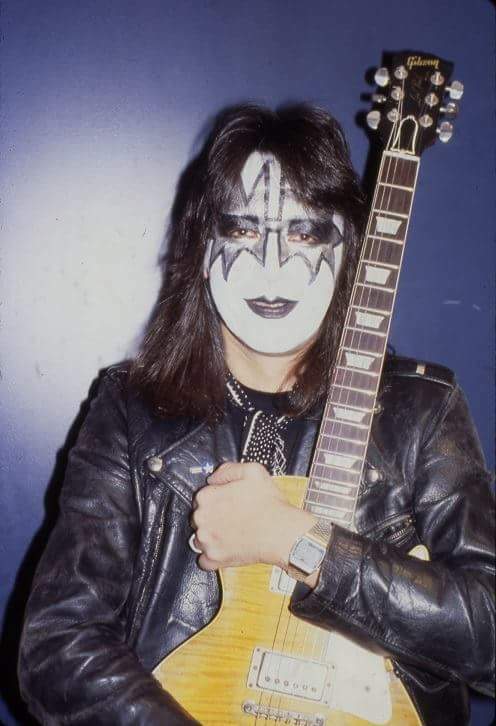 It was most definitely the guitar that Ace was heard playing, more than any other, on studio recordings between 1977 and 1985. That time period incorporates some of Ace's greatest and most memorable tracks ... Rip It Out, Snowblind ... in fact, his whole first solo album in 1978, except for parts of Ozone (which were doubled with a Danelectro, tuned to Open G). All of the Dynasty recording including Ace's cuts ... Hard Times, 2,000 Man and Save Your Love. Torpedo Girl, Two Sides Of The Coin and Talk To Me from Unmasked are The Frehley Burst. Dark Light on The Elder, is The Frehley Burst. The songs are countless. Once he got this guitar the others were used just for live and this became his number one guitar. Ace had said to Al, "It wouldn’t go out of tune. It's a truly magical guitar. Its the best one I have ever played, owned or even seen". Copyright 2015 "We Buy Guitars" - This image is used by permission. 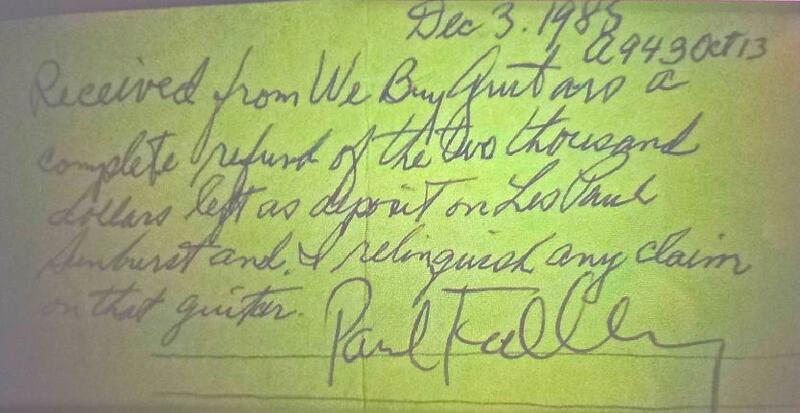 "We Buy Guitars" original receipt dated Dec. 3, 1985 with Ace's (Paul's) signature. Pictures on this page are owned by and used with the permission of Al Romano. Reproduction in whole or in part is strictly prohibited under penalty of law.